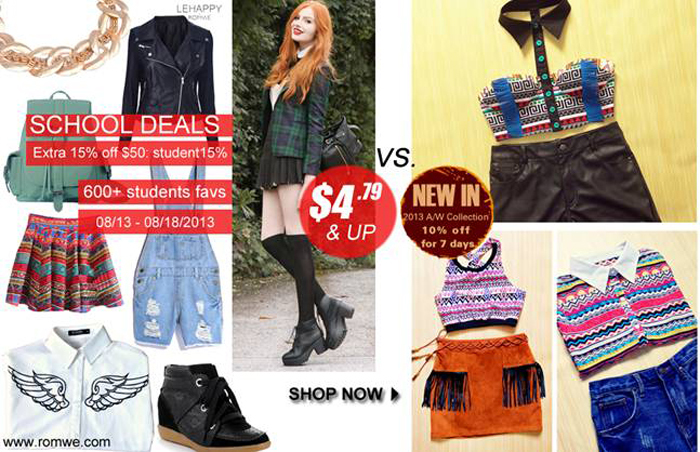 Back to School with ROMWE! As the new term comes, ROMWE has carefully prepared more than 600 students’ favorite items. ROMWE always has so many pieces to meet different demands. You can collect all the coolest school clothes here. Now, a big School Deal begins, with the prices starting from $4.79. New items have 10% off discount too. So many beautiful and hot items are waiting for you : ﻿﻿﻿﻿﻿Oversized Aztec Denim Coat, ROMWE Vertical Stripe Black-White Leggings , Gold-tone Riveted Mint Jumper, etc.